Awarded top three tacos by Foursquare in the United States, it is no question these tacos are the bomb.com. The coolest place is in New Port Richey but is totally worth the hike. As you walk in, the sharp smells of charred pork and onions and herbs hit you, instantly making your tummy grumble. It has got the look of a country farmhouse meets Mexican food, with wooden picnic tables and colorful skeletons decorating the wall. There is a huge kitchen where you can see the chefs make the food served fresh. This place works like a fast food place even though it is far from it. The menu is jam packed with all sorts of tacos that have taken a regular chicken taco to the next level. The menu works by offering a certain combination of food which can be ordered into a taco (3.75), burrito (9.75), rice bowl (9.75), salad (9.75), or nachos (9.75). Flavors range from chicken to chorizo to steak to even avocado. 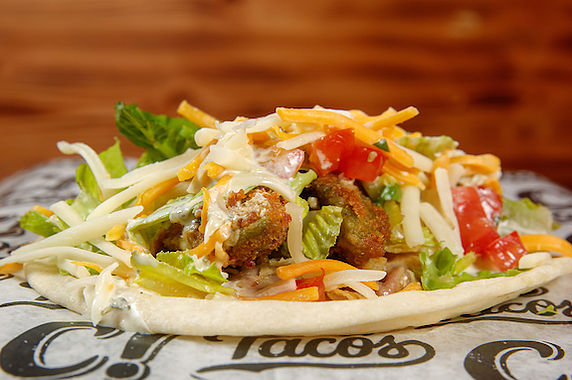 My favorite is called the mean verde, which contains fried avocado, refried pintos, queso, poblano ranch, lettuce, and pico de gallo. The warm and crunchy avocado pieces is something really unexpected and wild but works perfectly wrapped in a tortilla. They even have a breakfast taco with house-made chorizo, scrambled eggs, chihuahua cheese and salsa morita Another yummy taco is called the peacemaker, which is made with fried adobo chicken tossed in Texican BBQ sauce. Taco sizes are pretty large too, especially with the amount of food packed into the taco, they are very filling. To complement the tacos, they also serve Mexican soda like Jarritos and Mexican coke which makes the experience more authentic. Capital Taco even makes their own soda like orange cream and lemon lime. So if you happen to be shopping in the Tampa outlets or your tummy is rumbling, this place is definitely worth the try.